Mediasite and TechSmith Relay are no longer avialable at UWGB. This document summarizes how to us CaptureSpace Lite or OBS studio as a work-around lecture capture recorder. While fine as a review resource or for future reference by the instructor, full-class lecture capture is not a recommended practice for instructional purposes. Shorter (less than 10-15 minutes), content-specific, videos tend to work better in an online context. To use Kaltura Capture Desktop Recorder, it needs to be launched using any of the following methods. Option 1 - From "My Home:"
Screen area recording preview - click this to disable or enable the screen area for your recording. If you have more than one monitor, select which you're using with the caret. Webcam preview - click this to disable or enable the webcam for your recording. This will not appear if Capture does not detect your webcam. Microphone - click this to disable or enable your microphone. If you have more than one mic device, select which you're using with the caret. Manage - use this link to manage any recordings you have stored on your computer (e.g. delete, describe, upload, etc.). You can also change the resolution of your screen and camera, and toggle system audio recording. You would want to record system audio in the event you were capturing other media or items with sound within your recording. Notation tools (pencil icon) - clicking this opens the notation tools (upper half of above image). You can draw [pencil selected], make arrows by clicking and dragging [arrow selected], write text [T selected], record the mouse pointer with "clicks" indicated visually [arrow selected], move notations by clicking and dragging [4-way arrow selected], change notation color, discard/clear all notations [trash icon], and adjust the width of notations [vertical slider]. Once you click Stop and confirm you're ready to stop, you'll be automatically taken to the "Manage" page. You can change the title, add a description, and any tags you want. When ready, click Save and Upload. You can also just save your recording an upload it at a later date from the Manage page. Instructors may wish to record specific sections of their lectures using OBS Studio. Repurposing face-to-face lecture recordings for online courses is not recommended. OBS Studio can be installed from the Software Center on campus computers. NOTE: You will probably need administrator permissions from the helpdesk to install the software. Under Video, ensure that the "Base (Canvas) Resolution" is either 1920x1080, 1280×720, or 1024×576 and that the "Output (Scaled) Resolution" matches it. The smaller video sizes are generally recommended. Under "Sources" click the plus sign and choose "Display Capture." Select the display under the "Display" dropdown (if applicable) and click OK. Note: You will probably see the "infinite screens" effect if you select the display you are currently using. Under "Sources" click the plus sign and choose "Audio Input Capture." Select your microphone (if applicable). By default, the software will also record the "Desktop Audio"
Most people do not use "Scenes" (apart from the default) or Scene Transitions. If you are capturing a webcam as well, click the plus under "Sources" again and select "Video Capture Device" use the preview and, in most cases, the default settings to ensure that it's set up properly. Once you've added the webcam source, you may need to use the up and down arrows under "Sources" to ensure it appears on top of the display. Repeat step 1 and/or 5 to add additional displays or sources (such as additional web cams) if any. You may wish to alter the layout of the inputs. Do so by clicking and dragging and using the red circular handles on the corners of the regions. 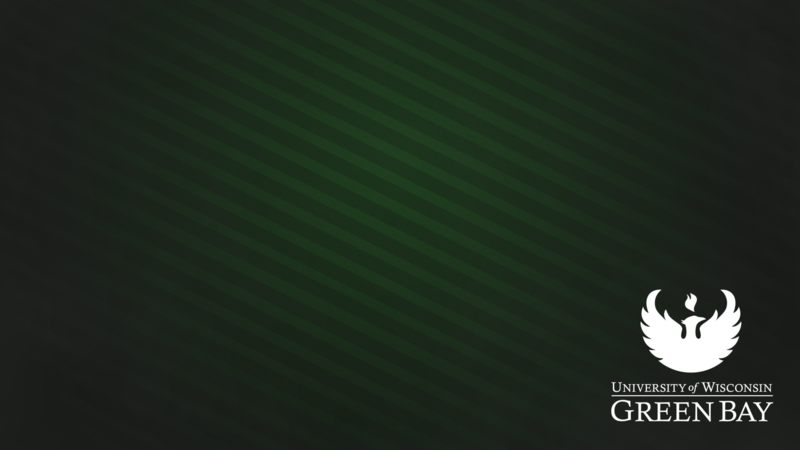 Pro tip: Use THIS IMAGE as an additional "Image" by clicking the plus sign under "Sources" and move it to the bottom using the arrows for a nicely branded UWGB background. NOTE: If content is bigger than the canvas (likely if using a smaller resolution in Step 3 under "Settings"), just right click its preview and select Transform > Fit to Screen. 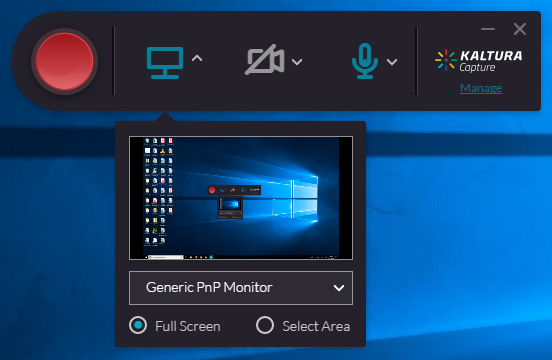 Once your setup is complete, click Start Recording under "Controls" Note: nothing pops up telling you it is recording, but the "Start Recording" button will change to "Stop Recording"
Most of the time, you'll want to just minimize OBS Studio while presenting. When done, open it from the task bar/system tray and click "Stop Recording"
Check that your video appears on your flash drive or in your alternative designated location. Once Kaltura has successfully processed your videos, you can add them to your course as you can any other Kaltura content. Here are some options for adding Kaltura content to D2L.